AITCH AITCH — Our Process. A deeper look into the design and construction of AITCH AITCH pieces. 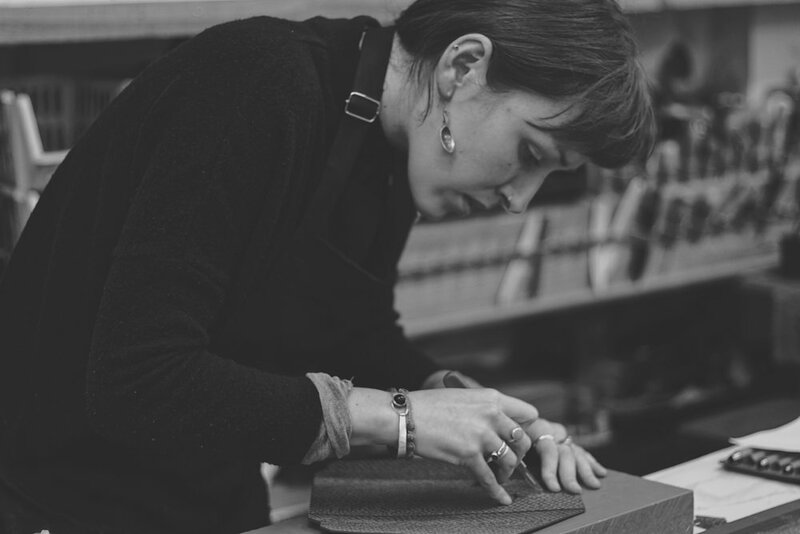 AITCH AITCH works with a renowned leather crafting studio in London’s Holloway neighborhood. The studio is dedicated to keeping the time-honored tradition of leather crafting alive, with ongoing education and apprenticeships with their senior staff. While their techniques are learned from generations of leather crafting practices, the studio is forward thinking in the evolution of their trade. With the grounding principles of traditional leather techniques holding true, the studio is a front runner ininnovative designs and materials. AITCH AITCH works closely with our master craftsmen and women to meticulously execute each piece with nuanced finishes and construction. Each AITCH AITCH handbag takes between 15 and 30 hours to make. Because of the unique paneling and sturdy construction of each piece, the process of creating each bag is unique to AITCH AITCH. The paneling technique seen on each AITCH AITCH piece creates the signature look of the collection—while most paneling techniques are rectangular, we use trapezoidal patterning that was inspired by the natural shape of the untouched skins. This unique paneling technique showcases the natural beauty of the skins while also minimizing waste. The pattern making for each AITCH AITCH piece is thoughtfully designed, taking the trapezoidal patterning of the panels into consideration. The development of the pieces for the debut collection took time to develop—a labor intensive process of trial and error until we found the perfect construction. Founder and creative director Hailey Harmon’s apprenticeship with a former Hermes craftswoman created a seamless relationship between herself and the studio while developing the early stages of the pieces. Founder and creative director Hailey Harmon’s background in fine jewelry led her to custom design all the hardware for the AITCH AITCH brand. It’s manufactured in a company-owned and operated factory in Hong Kong—and the company we work with produces hardware for top name luxury handbag brands. Because the hardware manufacturing isn’t outsourced, there is transparency in the fair labor and trade laws that they strictly adhere to. The finishing touches are added to each handbag, including tightening and securing hardware and final edge painting. After 15-30 hours of working on an AITCH AITCH handbag, the process is complete. There is a final quality control check, ensuring each piece is up to the highest standards of construction and design. Our long history of development with our studio has created a strong bond and working relationship, with common ethos of preservation and innovation at the core of both of our businesses.